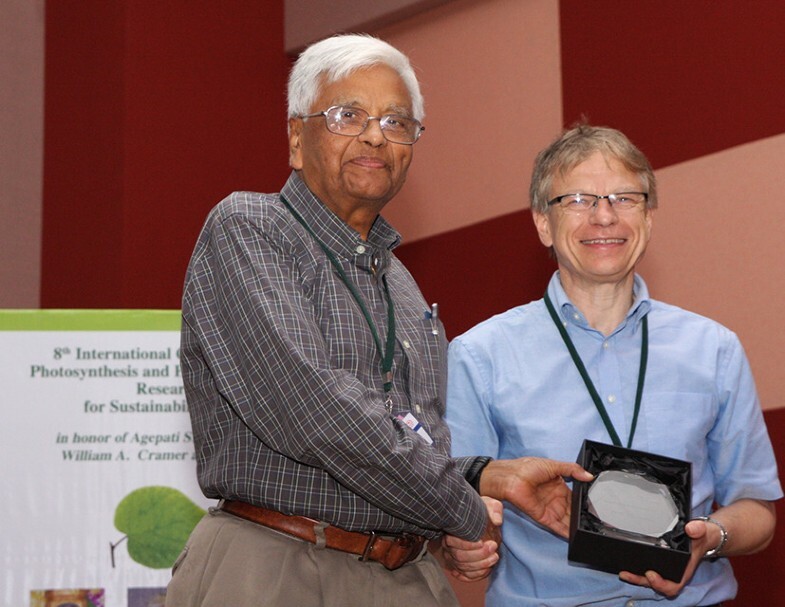 Govindjee’s outstanding contributions to photosynthesis research and education as well as his magnificent service to the photosynthesis community have been ongoing for over 60 years (Fig. 1). These achievements were recognized at the 8th International Conference on Photosynthesis and Hydrogen Energy Research that was held at the University of Hyderabad (UoH) between October 30 and November 4 in 2017. This meeting, hosted by the Department of Plant Science in the School of Life Sciences at UoH, honored the career of three excellent scientists, Agepati S. Raghavendra, William A. Cramer and Govindjee. The Hyderabad Conference was in fact held just 6 days after Govindjee’s 85th birthday. There have been several earlier celebrations for Govindjee; it is noteworthy that his career was also celebrated in a Special Issue of Photosynthesis Research in 2007 to coincide with his 75th birthday (Eaton-Rye 2007a). Many of Govindjee’s past students, postdocs and past collaborators sent in their reminiscences to be included in that special issue (Eaton-Rye 2007b). Further, in 2008, in Indore, India, an international conference was organized to celebrate his career (Jajoo et al. 2009). In addition, for Govindjee’s 80th birthday, colleagues from around the world joined to celebrate his contributions and dedication to the photosynthesis research community (Eaton-Rye et al. 2012; Allakhverdiev et al. 2013; Eaton-Rye 2013; Prášil 2014). This culminated in Itoh et al. (2015) and Papageorgiou (2015) dedicating a book on a broad range of topics in photosynthesis research to Govindjee. To mark his 85th birthday, Photosynthetica produced a Special Issue consisting of 45 articles with 167 authors from 20 countries (cf. Garab 2018; see Eaton-Rye 2018); additional recognition of Govindjee at his 85th birthday was held at the University of Udaipur (see Soni 2018; Soni and Kaur 2018). The Hyderabad conference thus joins a long list of events that have recognized Govindjee’s outstanding accomplishments (Fig. 2). In addition, his publications from across his career have been summarized by Clegg (2012), Eaton-Rye (2012, 2018) and Papageorgiou (2012). 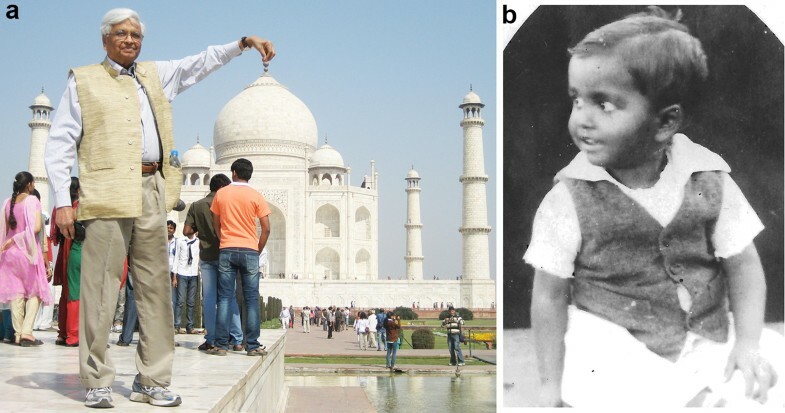 In his personal perspective in this Special Issue, Govindjee outlines his research journey beginning with his MSc in Botany from the University of Allahabad in 1954, followed by his PhD studies at the University of Illinois at Urbana-Champaign (UIUC), and his subsequent career at UIUC as Professor of Biochemistry, Biophysics and Plant Biology (retired in 1999) and now Professor Emeritus (Govindjee 2018). In addition to his prolific research career with over 400 publications, Govindjee has been continuously active in supporting all aspects of education in photosynthesis. These activities began with a coauthored basic book on photosynthesis (Rabinowitch and Govindjee 1969), three articles in Scientific American (Rabinowitch and Govindjee 1965; Govindjee and Govindjee 1974; Govindjee and Coleman 1990), four edited books on photosynthesis (Govindjee 1975, 1982a, b; Govindjee et al. 1986), and now a current educational perspective of photosynthesis (Shevela et al. 2018). 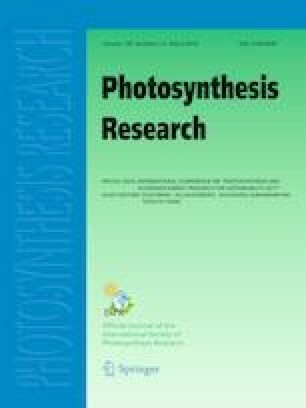 In 1994, Govindjee launched the highly successful Advances in Photosynthesis and Respiration Book series serving as its series editor up until 2017 (together with Thomas D. Sharkey from 2012) (see https://www.springer.com/series/5599). Volume 34 of this series (Eaton-Rye et al. 2012) was dedicated to him for his many teaching and other educational contributions. Govindjee was also coeditor of several influential volumes in the series with: (i) Barbara Demmig-Adams, Gyozo Garab and William Adams III on how plants protect themselves against excess light (Demmig-Adams et al. 2014); (ii) Agu Laisk and Lada Nedbal (Laisk et al. 2009) on in silico photosynthesis; (iii) Tom Beatty, Howard Gest and John Allen (Govindjee et al. 2006) on discoveries in photosynthesis; and (iv) George Papageorgiou (Papageorgiou and Govindjee 2004) on the use of chlorophyll a fluorescence to understand photosynthesis. It is noteworthy that the Discoveries in Photosynthesis (which was Volume 20) is a must read for anyone interested in the history of plant science. In 1983, Govindjee was approached by Mr. Ad Plaizier (of Martinus Nijhoff/Dr. Junk) to take up the editing of Photosynthesis Research. His service as an editor is praiseworthy since during his tenure as Chief Editor, the number of pages increased fourfold from ~ 400 to ~ 1600 pages per year (Govindjee et al. 2002). Govindjee has also taken a particular interest in recognizing and honoring both established and young scientists. This led to Govindjee establishing a History & Biography section of the journal. The Govindjee et al. (2006) book (Volume 20, mentioned above) is the culmination and integration of 111 articles from this Historical Corner of the journal, with 132 authors (from 19 countries), many being the discoverers themselves. In addition to the above service, Govindjee has coauthored many Tributes and News Reports honoring both young and established scientists (see Appendix 1 for a list of Tributes, and Appendix 2 for many News Reports; also see http://www.life.illinois.edu/govindjee/recent_papers.html, for more). In a similar vein along with A.S. Raghavendra of the UoH, Govindjee honored one of the greatest scientists of India, Sir Jagdish Chandra Bose (Raghavendra and Govindjee 2011). I conclude this short summary of Govindjee’s outstanding contributions to photosynthesis by highlighting the Govindjee and Rajni Govindjee Award for Excellence in Biological Research given each year at UIUC (Fig. 3; also see http://www.life.illinois.edu/govindjee/photooftheyear2018.html). Govindjee’s 85th birthday, on October 24, 2017, was also the 60th wedding anniversary of Govindjee and Rajni who married while PhD students in the laboratory of Robert Emerson (1903–1959). Rajni also went on to a long career at UIUC, first in photosynthesis and then she subsequently worked on the molecular mechanism of proton transport in bacteriorhodopsin from Halobacterium halobium (see Ebrey 2015). The Govindjee and Rajni Govindjee Award for Excellence in Biological Research was established in 2006 to support expenses for graduate students at UIUC for conducting research in any aspect of Plant Biology and Biochemistry (see http://sib.illinois.edu/graduate/grants/Govindjee). The awardees are listed in Appendix 3. The reader will lean a great deal about Govindjee’s career from his own account in his informal personal perspective of research (Govindjee 2018). Among his many research accomplishments, Govindjee pioneered the first picosecond measurements on Photosystem I and Photosystem II primary photochemistry and he established the unique role of bicarbonate on the acceptor side of Photosystem II; in addition, he provided the first comprehensive theory of thermoluminescence in algae and plants and made great strides in using delayed and prompt fluorescence to understand both photosynthetic electron transport and photoprotection against excess light. These achievements and much more are discussed in an excellent interview by Don Ort, a colleague of many years at UIUC, who conducted it on behalf of Annual Reviews, Inc (https://www.youtube.com/watch?v=cOzuL0vxEi0). Govindjee’s web page is also an excellent source of information on photosynthesis and his outstanding career (http://www.life.illinois.edu/govindjee/). On behalf of everyone in the photosynthesis community and beyond who have benefitted from Govindjee’s commitment to science—and his ceaseless efforts to facilitate the careers of all those who cross his path—a huge Thank You to Govindjee Govindjee (your new formal name since 2018) for all that you have done for us. The preparation of this manuscript was supported by funds provided by the Department of Biochemistry, University of Otago, New Zealand. The Govindjee and Rajni Govindjee Award for Excellence in Biological Research was established in 2006 to support expenses for graduate students at the University of Illinois at Urbana-Champaign for conducting research in any aspect of Plant Biology and or Biochemistry; it is administered by the School of Integrative Biology (SIB), and the School of Molecular and Cell Biology (MCB). 2013: Robert (Bob) Koester; Adriana Corrales Osorio; Samantha Primer; Rebecca (Becky) Slattery, and Robert Van Buren.